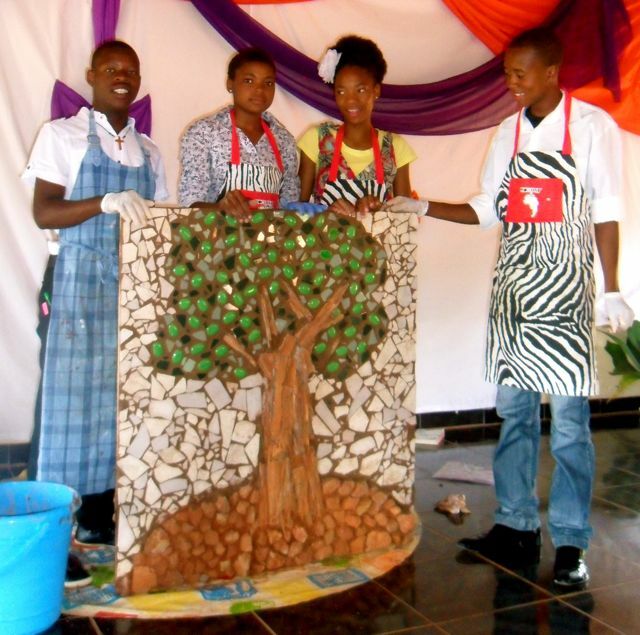 After seven months of learning, growing and adding one piece at a time, the Evangelical Reform Church in Mbonisweni has completed a masterpiece! Every month this year, TTH staff member Kacy Chaffin has taught the church about who they are in the Family of God. Kacy challenged them to know and believe in the health, hope and the promises from God for their families. Parents, mothers and fathers learned their specific roles in their families and committed to do their part by placing their unique piece on the artwork. At the end of the year, they watched plywood covered in scraps of broken tile, discarded wood and rocks become a masterpiece as the cracks between the pieces were sealed with grout. It was a transformational moment for the church when they began to understand that, because Jesus died on the cross, the sealing grace of forgiveness was released and a collection of broken pieces become one complete masterpiece. The church began to receive forgiveness in Christ, to extend forgiveness to their family members, and to see themselves as valuable pieces in the Family of God. A simple piece of art has become an image of the Family of God, just as we were created in the image of God. A church in Mbonisweni was transformed from a house of broken pieces to a masterpiece of His image. God is not finished with them yet, and we believe this is the beginning of their role in ending the orphan crisis in South Africa! Believe with us and know that the same grace and sealing transformation are available to you as we end 2011. We believe God’s masterpiece will be enhanced, redeemed and expanded in 2012, and we are thankful for art to remind us to celebrate His work. As you pray for more transformation in Mbonisweni and in South Africa, take a moment this week to enjoy art. Pray for the church to stand up in their roles in the Family of God and for God to show you your place as you peruse an art museum, appreciate photography or even create your own art!